Ceremonial funeral hall to be in the West Ulsan Boram Hospital, Ulsan. Mourners flowed in and out all day at the ceremonial funeral hall has been set up in the West Ulsan Boram Hospital where YeomCheong Monk, the founder of Gonamsa Temple passed away at the age of 80. On behald of the entire UNIST community, President Mooyoung Jung of UNIST and the UNIST student president KyeongSeo Doo visited YeomCheong Monk’s mortuary to honor the memory of the deceased. 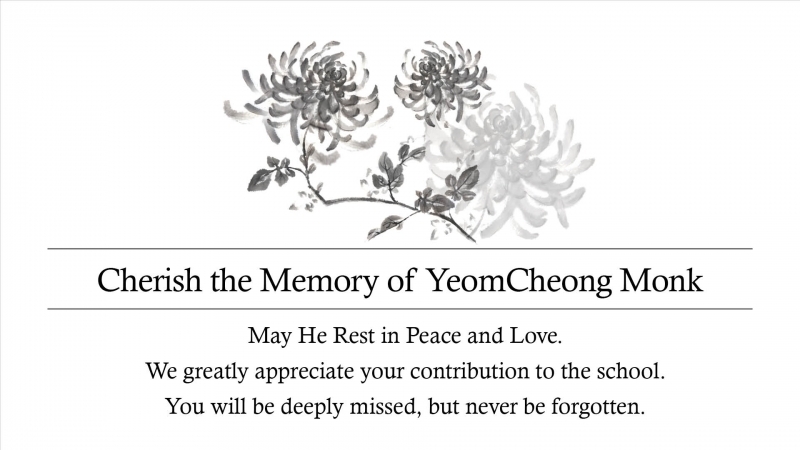 “We greatly appreciate his contribution to the school and it will never be forgotten,” President Jung said while expressing his condolences. “In support of his wish, UNIST will continuously work hard in cultivating creative and innovative minds who will carry the future”. YeomCheong Monk did a number of good deeds during his lifetime. YeomCheong Monk said in his life that one of his lifetime wishes was to donate all of his possessions to society. With the lauch of UNIST in his hometown, YeomCheong Monk decided to donate his entire fortune to UNIST, thereby helping to cultivate young scientists who will shoulder the future of Korea. And so, in March 2009, he donated one billion won of his fortune to UNIST Development Fund in wishing UNIST tremendous success. YeomCheong Monk became a Buddhist monk at the age of 40 and built his own temple, the Gonamsa Temple over a score of years. Having a strong interest in science and technology, YeomCheong Monk had developed and patented an invention, called “Antipollution Purifier”.